static DATA_BLOB CRYPTPROTECT_PROMPTSTRUCT DATA_BLOB *static LPWSTR DATA_BLOB CRYPTPROTECT_PROMPTSTRUCT DATA_BLOB *static char secret  = "I am a super secret string that no one can see!" static char secret2  = "I am a super secret string indescribable string"
static char key  = "Wibble wibble wibble"
Definition at line 244 of file protectdata.c. Definition at line 42 of file protectdata.c. Definition at line 109 of file protectdata.c. Definition at line 216 of file protectdata.c. Definition at line 38 of file protectdata.c. 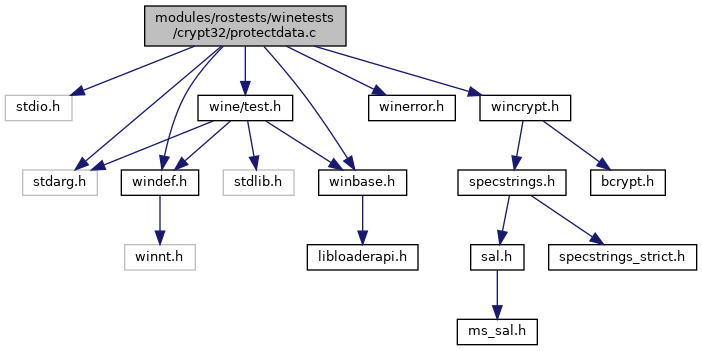 Referenced by rc2_ecb_decrypt(), rc2_ecb_encrypt(), START_TEST(), test_cryptprotectdata(), and test_cryptunprotectdata(). Definition at line 39 of file protectdata.c. Referenced by START_TEST(), test_cryptprotectdata(), and test_cryptunprotectdata(). Definition at line 40 of file protectdata.c. Definition at line 36 of file protectdata.c. Referenced by test_cryptprotectdata(), and test_cryptunprotectdata(). Definition at line 30 of file protectdata.c. Referenced by convert_hash_to_blob(), serialize(), serialize_dword(), and unserialize_dword(). char key = "Wibble wibble wibble"
Definition at line 35 of file protectdata.c. Definition at line 37 of file protectdata.c. DATA_BLOB CRYPTPROTECT_PROMPTSTRUCT DATA_BLOB* static LPWSTR DATA_BLOB CRYPTPROTECT_PROMPTSTRUCT DATA_BLOB* static char secret = "I am a super secret string that no one can see!" Definition at line 33 of file protectdata.c. char secret2 = "I am a super secret string indescribable string"
Definition at line 34 of file protectdata.c.